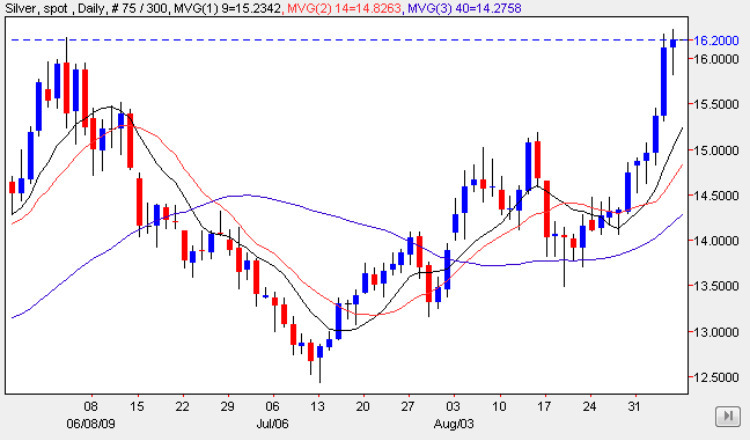 The spot silver market closed last week in bullish mood, having followed the strong move higher in the gold market which finally broke out of the pennant pattern we have been highlighting for the last few weeks, and is which is now teasingly poised below the $1000 per ounce level once again. The break higher in spot silver prices was equally dramatic, with silver closing the week above the $16 per ounce level, and with Friday’s candle closing the silver trading session with a deep lower shadow, suggesting that the bullish sentiment will continue this week. The weekly chart for spot silver is equally bullish with 9 week now crossing above the 14 week moving average, with the next key level being the strong resistance now in place at the $16.55 per ounce level. This is a deep band of congestion on the silver chart, and will require significant and sustained momentum if we are to break higher as we look towards an $18.50 price per ounce and beyond. The momentum may well come from the gold market, which should see further bullish moves this week once we have broken above the psychological $1000 per ounce level. If so this may provide the necessary drive for silver to break into the above resistance and to make further progress higher during the week. Monday is of course Labor day for the US and Canadian markets, so trading volumes across all commodity markets will be lower than usual, and therefore we may have to wait until Tuesday for more meaningful moves in the silver markets as silver traders return from the long weekend.